Stencils can create perfectly shaped brows in a snap. Eyebrow stencils are a quick and easy way for novices to achieve perfect eyebrow shapes without complicated measurements and angles. Yet while using stencils may seem easy, they can be just as easy to use improperly and it is important to understand how to choose, use, and refine stencils to achieve the best effect. There are several types of brow stencils available and each one is easy to use. Before committing to a particular brand, it is important to understand the differences between them and choose which one will work best for your eyebrow shaping needs and facial features. Celebrity-Inspired Stencils: These stencils mimic the stunning professional shapes sported by numerous celebrities, but they will not give you an instantaneous Hollywood makeover. Celebrities use professional salon technicians to achieve the perfect look, and it is important to consider the celebrity's hair color, face shape, and facial features to determine whether their eyebrow shape is suitable for you. Plastic Stencils: These stencils are made from sturdy yet flexible plastic and can be frequently reused to achieve consistent results. The stencils should be thin enough that they can be used comfortably, and they should be thoroughly cleaned before and after use to prevent dirt and bacterial buildup that could cause infections. Pre-Waxed Stencils: These are both eyebrow shapes and wax in one; after firmly applying the stencil, it can be used as a waxing strip to automatically remove hair. This may seem efficient, but it does run the risk of removing too many or too few hairs. Pre-waxed stencils are best used with a familiar brow shape for touch ups rather than completely new looks. Printable Online Stencils: Some beauty and makeup websites offer printable eyebrow stencils suitable for one-time use. When printing these convenient stencils, be sure not to adjust the size or else the proportions of the stencil will be altered and the desired look will be distorted. One-use stencils are great for trying a new look before purchasing full stencil sets. Stencil Sets: These stencils come in coordinating packages of 3-4 subtly different stencils. While they are all similar, they do provide slightly different looks with minimal modifications, and can easily be used by the same person for different results that do not appear to be drastic changes. Regardless of the type of stencil you choose, it must be used properly to achieve the best results. Choose a stencil shape that is close to your natural brow shape (length, curve, arch); drastic changes can results in drastic expressions that look anything but natural. 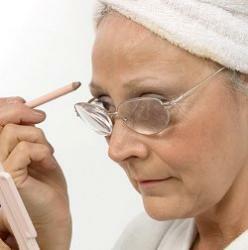 Clean and groom the brow thoroughly before applying the stencil. Trim long hairs and brush the brow in the direction of growth for best results. Apply stencil aligned to the natural beginning and ending of brow. Hold stencil firmly in place. Trace outline of brow shape through stencil with brow pencil or mascara. If the stencil is a thin shape, simply fill in the desired brow completely. Note: In the case of a pre-waxed stencil, this step is not necessary. Carefully remove the stencil without smudging the sketched guide. Note: For pre-waxed stencils, remove as directed to remove hair simultaneously. Remove hair outside the stencil outline by plucking, waxing, or other grooming techniques. Reapply the stencil to refine the shape if necessary. Remove stray hairs with tweezers for a polished, professional result. If using eyebrow stencils to achieve an entirely new shape or to correct damage to the eyebrow, different steps may be necessary. If you are using a stencil to achieve a drastically different brow shape, it may be necessary to use a larger stencil first to avoid removing too much hair. When positioning the stencil, be sure the ungroomed hairs are not overlapping the edge of the stencil; use tweezers or a fine pointed object to carefully position hairs correctly. Pre-waxed stencils are not recommended for initial brow shaping; the process may be too painful and is not likely to remove all the necessary hair for perfect results. Stencils can be used to fill in brows accurately. Stencils can be used to correct over-plucked brows. Simply position the stencil over the brow and gently fill in the open area with a brow pencil, eye shadow, or mascara. The most natural results will be achieve by using cosmetics that are as close to the natural color of the brow as possible - avoid shimmery or glittery products that will accentuate the brow. Eyebrow stencils can be purchased in a number of places. Fine salons that supply cosmetics frequently offer stencils as well, along with department stores and drug stores that have beauty counters. Online stores have a wide selection of brow stencils, as do cosmetology supply stores, many of which are open to the public. Most stencils cost less than $10, though kits with multiple stencils and other equipment may be slightly more expensive. Eyebrow stencils are quick and easy to use beauty aids that can help individuals craft perfectly shaped brows in seconds, without the hassle of measurements and guesswork. By choosing the best stencil and using it properly, having professionally groomed brows is a snap, even for someone who has never shaped their brows before.